Jerry Lee, we still miss you! 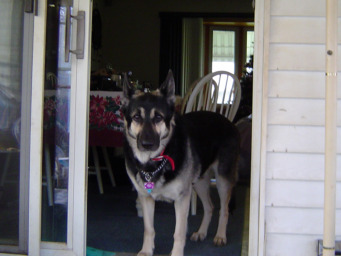 It has been some time since we lost our 10 1/2 year old German Shepherd, Jerry Lee, but he is still missed every day. He was one of a kind, he was the most loving dog to us, even though he scared most people. If he sensed any apprehension from anyone, he loved to growl and intimidate them.... and he was quite good at it. He never hurt anyone, just loved to scare them. However, he was so gentle to our mothers, even though he scared dad and my brother to death. He was a loving companion and fierce protector of our home. He will always be missed. We love you, Jerry Lee! Cherie, first of all let me take the time to tell you how sorry I am for your loss. It is so very hard to lose a wonderful pet German Shepherd. But your memories will help you through the long grieving process. Thank you again for sharing your story about your Dog, Jerry Lee, here with us.